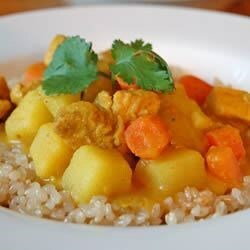 "A rich, deliciously creamy, and hearty dish with a mild curry taste." Mix the cauliflower, curry powder and garlic salt into the skillet. Pour in the coconut milk and chicken stock. Season with salt and pepper. Reduce heat to low. Continue cooking, stirring occasionally, 30 minutes.